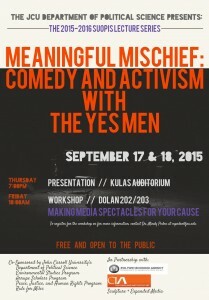 Meaningful Mischief with The Yes Men! This year’s Suopis Lecture Series was a HUGE success! Many thanks to the Yes Men for visiting the JCU Campus, and for giving an entertaining, yet very informative, presentation. Click here to view the presentation, in its entirety. Contact Dr. Mindy Peden at mpeden@jcu.edu for more information or to register for the workshop! Watch the 2018 Suopis Lecture Series with Sean Webster!